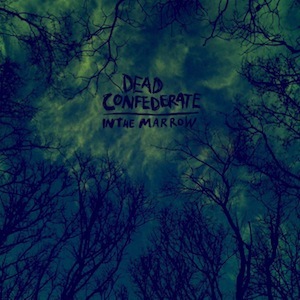 Fans of full-force rock music with an edge, look no further than Dead Confederate“s third studio LP, In The Marrow. Hailing from Atlanta, GA and formed in 2006, the five-piece already has a handful of respectable releases, including Sugar in 2010 and last year”s Peyote People EP, but their latest work takes the psych-tinged indie-rock to another level. Each track a solid rumble of grungy reverb, In The Marrow is what psychedelia would sound like emanating from Kurt Cobain“s grave. Though Seattle-grunge-inspired, there”s something decidedly Southern about Dead Confederate. The name obviously plants that seed, but frontman Hardy Morris’ honest vocals and their twangy alt-country guitar melodies, like in “Dead Poetry” and “Big City Life,” seal the deal. The album’s opening song “Slow Poisons” is one of the most memorable, veering into intricate post-rock territory at times. And the undulating waves of bass and rhythm in “Vacations” make the track somehow sound both subterranean and soaring. Essentially, this is some solid indie-rock at its most raw and ferocious. Who can resist psych and grunge-injected rock ’n roll when it’s this good?